As you are well aware, losing weight requires plenty of movement and what can get you on the move better than cardio? You can only reduce your weight when the burnt off calories exceed the consumed. Aerobics is an excellent and enjoyable opportunity to exhaust your energy. You’re probably thinking about how to fit such trainings into your weekly schedule. Don’t worry, it’s not that much: 2 to 3 sessions lasting for 20-30 minutes each are enough. Before you start, you need to know a vital trick about cardio: it’s not the frequency or the duration of your sessions that matters but rather the execution. In other words, take your cardio practice as seriously as your weight training sessions. Devote only 30 minutes to cardio but really do your best. The more you strain during the training, the more energy you will exhaust (consequently, the more pounds you will lose). Remember, cardiovascular training helps you burn body fat only when you succeed in speeding up your heartbeat. 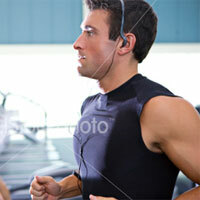 Personal trainers claim that in order to be efficient, cardio should make you feel uncomfortable. If you’re sweating, panting and turning red (but not purple! ), you’re on the right track. You’ll learn to reach the right intensity with practice. Don’t be fooled into believing that you’ll accomplish your goal by taking walks or leisurely runs. While these are good for your overall health, they will hardly be worth for losing the extra kilos. If you find intensive cardio sessions hard at first, start by climbing the stairs, swinging your arms or walking at a brisk pace. Ideally, you should reach the point at which you’re able to drain your body of the whole energy. When you advance a little, you can combine jogging, mountain biking, stairmaster, elliptical trainers or treadmill walking at a steep incline. Twenty minutes of jogging on the treadmill burn off the same amount of calories as a whole hour of walking on the treadmill. More intensive sessions will also save you time. Those 20-30 minutes will set up your metabolism to burn body fat. Don’t forget to always spare 5 minutes at the start of the session to warm up and another 5 at the end to cool down. If you’re wondering how to give your best in cardio each time, monitor the results you achieve or the time you need for a session. Then strive to stick to them at every practice or why not beat your own records? It’s wonderful to compete with yourself and to constantly go further. Take up your cardio trainings of 20-30 minutes, 2-3 times a week and you will soon be amazed by the results.